I learned so much from this book. Lesson number one: There is so much I don't know. Structured as a letter to his teenage son, Ta-Nehisi Coates writes with searing honesty about his experiences as a black man in America. Growing up in West Baltimore. Attending Howard University. Traveling abroad for the first time as an adult. Mourning the loss of a college friend, murdered by a police officer who was never held accountable for the crime. Struggling to be honest with his son about the risks and realities of being black in America without robbing him of his beautiful innocence. 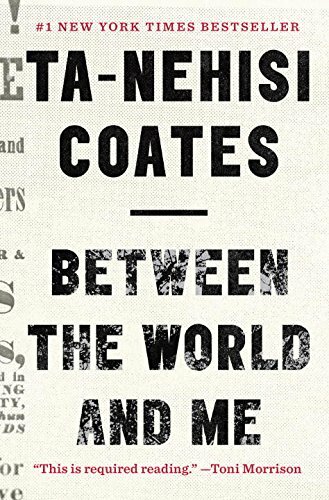 I chose the audio version, read by Coates himself. His voice carries such power, longing, and heavy sadness. I highly recommend experiencing the book this way. It is much harder to discount or deny difficult truths when they are being spoken in your ear by someone who has lived them. Coates also spoke eloquently in an interview with Terry Gross on NPR, which when I heard it convinced me I needed to hear his words from his mouth. Quite frankly, I was scared to read Between the World and Me. Scared to acknowledge my complicity in the way our country treats black and brown people. But that's exactly why I knew I had to read it. The fact that I can choose to opt out of this discussion is proof of my privilege—I don't have to care about racism, because it doesn't affect my daily existence. I'm no longer okay hiding behind that excuse. That I have been okay with it until now shames me. I am always going to be a white woman. There's no changing that. But if I want to be a white woman who is an ally for marginalized groups, if I want to be a white woman who uses her privilege to help others, if I want to be a white woman who confronts her own biases instead of pretending they don't exist, then reading books like Ta-Nehisi Coates's is absolutely essential. And, you know, shutting my own mouth once in a while so I can hear what other people are trying to say about what their lives are like in these United States of America.